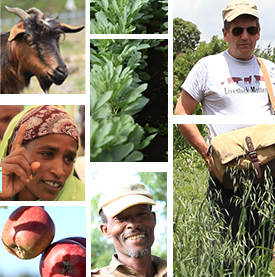 In 2012, Africa RISING funded an ‘early win’ project in Ethiopia led by the World Agroforestry Centre (ICRAF). The project aims to underpin the Ethiopian Climate Resilient Green Economy Initiative by providing early win tree species and management options for integrating fruit, fodder, fuelwood, fertilizer and timber trees in fields, farms and landscapes. This will enable sustainable intensification of farm systems by expanding the scope of options promoted by the initiative, and by targeting species and management options appropriately to sites and farmer circumstances. In the process, we will build a durable partnership amongst national and international institutions that will be well-placed to further refine the options available and their targeting. A novel aspect is bringing together tree, crop and livestock expertise to address the whole farm and landscape context. This is critical for the success of integrating trees in fields where they may compete as well complement crops, and where the management of livestock grazing is fundamental to the success of tree establishment. Local knowledge about integration of trees in fields, farms and landscapes documented. Best bet tree species and management options identified. Needs for development of the tree seed and seedling supply sector assessed. Effective partnerships for promoting tree-crop-livestock integration to underpin the climate resilient green economy initiative established.